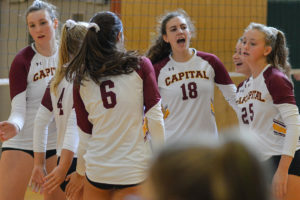 Betsy Knutson-Keller remembers the ensuing chaos following Devyn Oestreich’s match-ending kill last year, which clinched Capital High School the Class 3A state volleyball championship for the first time in program history. While her teammates collapsed to the floor, clinching each other and crying, Knutson-Keller simply froze. Knutson-Keller and her teammates have now had nearly nine months to settle into their new roles as state champions. The Cougars no longer ask themselves what it would be like if they won state. The new question this year is – what does Capital do for an encore? 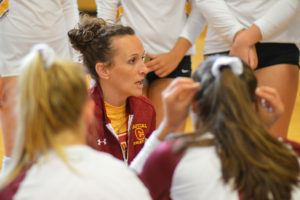 The Cougars had come close to winning state on a number of occasions, including in 2014 when they lost in the title match to undefeated powerhouse Auburn Riverside and in 1994 when current coach Katie Turcotte was the team’s setter, leading Capital to a second-place finish, but last year saw everything come together perfectly. Behind a nice mixture of senior players and underclassmen, the Cougars posted a 21-1 record in 2017, winning the 3A South Sound Conference and district championships before heading to the state tournament where they bested Mercer Island, 3-1, in the finals. Last year, Capital’s roster was equal parts veterans and younger players. The team had six seniors, a strong junior class and a pair of freshmen and sophomores who never stepped off the court. As it turned out, it was precisely the right combination to produce a championship squad. Gone is last year’s exceptional senior class, which featured all-state players in libero Elise Meath and setter Tia Grow. But don’t feel too bad for the Cougars as they return a bevy of talent. Joining Knutson-Keller as captains this year will be junior Maia Nichols and senior Teagan Jones. On the court, the Cougars once again feature one of the most talented rosters in the state. 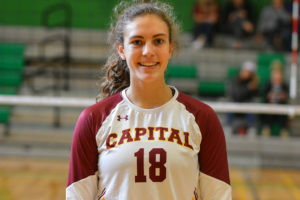 In addition to Knutson-Keller and Jones, who is a 6-foot-1 middle blocker, Capital also welcomes back Maia Nichols, who is coming off a sophomore campaign where she finished with a team-high 285 kills, 222 digs and 18 aces. 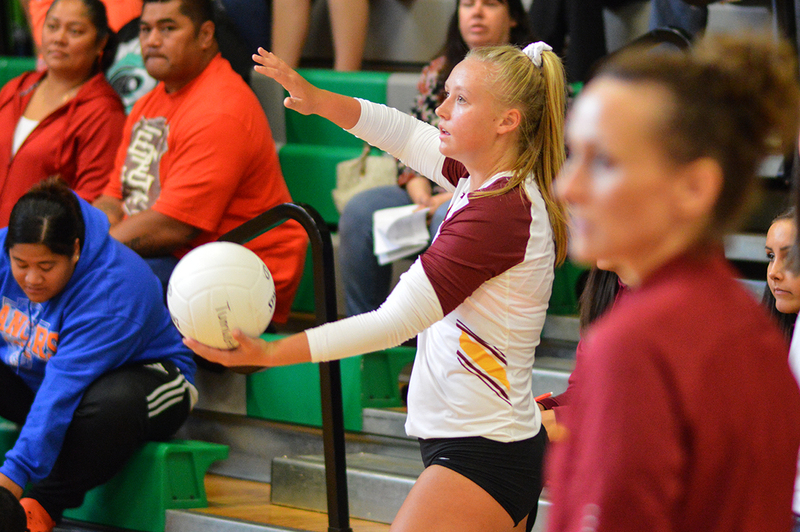 She was named the Class 3A state’s co-player of the year by the Washington State Volleyball Coaches Association. The honor came after she earned MVP of the 3A state tournament. Capital also returns junior setter Madeline Matthews and sophomore outside hitters Oestreich and Madison Nichols. Oestreich and Madison Nichols played nothing like first-year varsity players last season. Ostreich finished her freshman year with 244 kills, 57 digs, and 40 aces while being named second-team all-state by the coaches association. In last year’s championship match, Matthews had 14 assists and 11 digs. Knutson-Keller chipped in eight kills and two blocks. 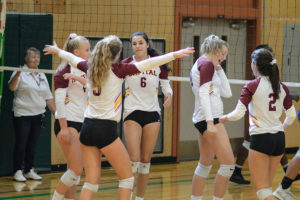 Oestreich finished with 15 kills, four aces and two blocks, while Madison Nichols had two kills, two blocks, and two digs to help the Cougars defeat Mercer Island in the championship match. 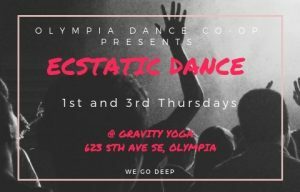 It is all valuable experience few programs in the state can boast as the new season begins. Capital will look to become just the sixth program to win back-to-back 3A state championships this year. Over the last 22 years, only Seattle Prep, which claimed three consecutive titles between 2001 and 2003, has been able to repeat as state champion.